Here are a few uplifting messages from our prophet, Thomas S. Monson, that can inspire us to trust in the Lord, no matter who wins the election. I testify to you that our promised blessings are beyond measure. Though the storm clouds may gather, though the rains may pour down upon us, our knowledge of the gospel and our love of our Heavenly Father and of our Savior will comfort and sustain us and bring joy to our hearts as we walk uprightly and keep the commandments. There will be nothing in this world that can defeat us. I declare that God lives and that He hears and answers our prayers. His Son, Jesus Christ, is our Savior and our Redeemer. Heaven’s blessings await us. The world can at times be a frightening place in which to live. The moral fabric of society seems to be unraveling at an alarming speed. . . . [Our Heavenly Father] is at the helm. We have nothing to fear. He is the God of light. He is the God of hope. I testify that He loves us—each one. . . .
At times there appears to be no light at the tunnel’s end—no dawn to break the night’s darkness. . . . We are inclined to view our own personal misfortunes through the distorted prism of pessimism. We feel abandoned, heartbroken, alone. If you find yourself in such a situation, I plead with you to turn to our Heavenly Father in faith. He will lift you and guide you. He will not always take your afflictions from you, but He will comfort and lead you with love through whatever storm you face. . . .
For more inspiring counsel from President Thomas S. Monson, A Future as Bright as Your Faith includes 365 days of uplifting quotes and messages from our prophet. 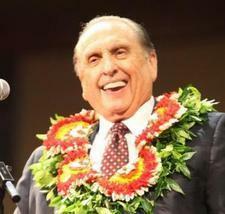 Or check out A Prophet's Voice: Messages from Thomas S. Monson.